Whispers about global warming got louder in 2012 after a string of unforgiving natural disasters and rising global temperatures. Here’s a look at some recent stories regarding climate change. 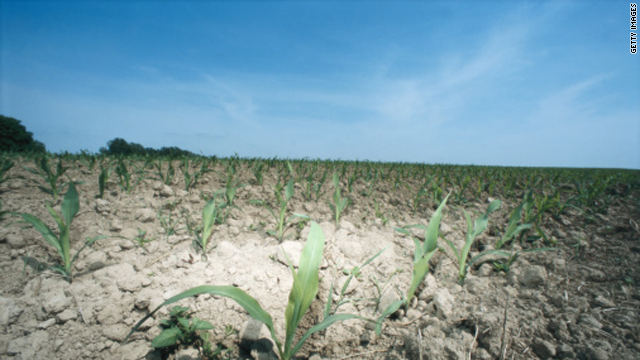 2012 drought: just the beginning? More anxiety surrounding climate change arose with the release of the “Iowa Climate Statement (PDF),” announced in Des Moines this week. It predicts that Iowa’s harsh drought season was a precursor of what is to come for the top grain-producing state. The statement, signed by 138 scientists and 27 Iowa colleges and universities, suggests that if there is little rain this winter and spring, “it would become a multiyear drought that would be serious,” according to Jerry Schoor, professor of civil and environmental engineering at the University of Iowa. But fret not, the scientists added: The drought should – and possibly will – prompt innovation in renewable energy, which would limit the number of greenhouse gases, regulating temperatures. The Central Intelligence Agency will permanently close the doors of its Center on Climate Change and National Security unit, formed in 2009 to examine the relationship between global warming and security measures. CIA spokesman Todd Ebitz told the New York Times that the agency will continue to observe intelligence challenges that may arise, but not in an individualized office. Remember “fracking”? It was an often-used term during the 2008 presidential race. The controversial drilling process, also known as hydrofracking, entails injecting large quantities of chemicals and other fluids into the Earth’s surface in order to crack rocks surrounding oil wells, allowing for more gas resources. On Tuesday, New York Gov. Andrew Cuomo confirmed that the state will miss its deadline on fracking regulations because of environment and health concerns surrounding the drilling. A report released by the World Meteorological Organization revealed that carbon dioxide emissions increased to 390.9 parts per million (ppm), up 30% since 1990. “What it shows isn’t surprising, but it obviously has very important implications for the future well-being of the planet,” said Richard Allan of the Department of Meteorology at the UK's University of Reading. Carbon dioxide is the No. 1 greenhouse gas emitted into the Earth’s atmosphere. The Kyoto Protocol, an international agreement among 37 industrialized countries to reduce greenhouse gas emissions, will convene for its annual weeklong conference Monday to discuss new ways of combating climate change. The protocol was signed in 1997 and is scheduled to end in 2012. Extending the protocol will be discussed, but if a compromise is not reached, there may not be another international environment-related pact until 2020. New research shows that rapid climate change led to the extinction of lemmings, small rodents that inhabited the Arctic during the last Ice Age. Their presence came in waves during the Late Pleistocene, 11,700 to 126,000 years ago. Experts believe they died out and then reappeared on several occasions in the span of 114,300 years. The findings go against some suspicions suggesting that humans play a key factor in global warming. Note to the writer of these stories: A species cannot become extinct and then suddenly 'reappear'. The scientists that put together this information probably have little appreciation for your horrific mistakes when presenting their work. In the future, perhaps you should strive to actually understand the stories you are writing about prior to putting something ridiculous on your website. Otherwise, you lose all credibility as a journalist and people will eventually stop reading your stories. All very well indeed, but in the Lemmings study, the conclusion was not that humans had little to do with "global warming" at the time which is probably obvious. The conclusion was that the extinction of "Megafauna", primarily large mammals and rodents, was not caused by human predation or killing, but by environmental change (warming) during the late Pleistocene (age). It seems the growing acceptance among environmental scientist is that climate change not something we can reverse or stop. It is futile to spend so much resources towards an unachievable goal. Considering the facts, climate change is natural, yes we may have effected the rate of change, but the change its self is not reversible. The current CO2 levels in the atmosphere would continue to rise at an inflated rate for the next 100 years even if we stopped all human release of carbon dioxide. There are much larger issues that will present its self in upcoming years that will make climate change seem like the golden years of concern about our future. The population projections for humans will become unsustainable by 2050 when it comes to resources such as food, water, energy, ect.